Dengue hemorrhagic fever caused by a virus that attacks the cells of the body through the bite of the Aedes aegypti mosquito. The impact of this virus is the destruction of platelet cells, because the cell wall of platelets is thicker and sensitive than other blood cell walls. This deadly disease usually found in tropical and subtropical regions, which strike during the rainy season comes. WHO has estimated that every year, there are at least 50-100 million cases of dengue infections in various parts of the world. In Indonesia, many people believe that the guava juice is a drug that can treat dengue fever because it is able to increase platelets. But there is no research that supports the claim. Think positive that can be taken by eating guava for dengue mean much fluid into the body, to recover body condition is weak due to decreased platelets. 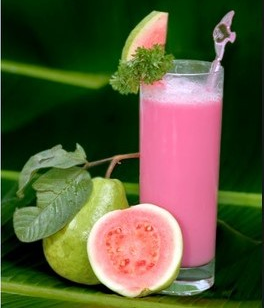 Guava or Psidium Guajava has many substances that are beneficial to the body. The content of vitamin C which has five times more than oranges. The content of vitamin C in guava able to meet the daily needs of children aged 13-20 years who reached 80-100 mg per day as well as adults reach 70-75 mg per day. Guava also contains flavonoids that can increase levels of platelets in the blood. In 100 g of guava contain energy 49 Cal, 0.9 g protein, 0.3 g fat, 14 mg calcium, phosphorus 28 mg, 1.1 mg iron, Vitamin A 25 SI, 0.02 mg Vit B1, Vit C 87 mg, and 86 g of water. Benefits of guava leaves for fever known to help prevent gastrointestinal cancers and lowers cholesterol. Benefits of guava fruit is not only the fruit, but the leaves are also often used as a medicine. In Guava leaves were found to contain tannins, volatile oils, and fatty oils. In the fruit contains vitamin C is high. The fruit is rich in beta-carotene and vitamin C. Benefits of guava leaves for dengue have been shown to inhibit the activity of the enzyme reverse transcriptase from dengue virus. According to research conducted by the Faculty of Medicine, University of Indonesia, Faculty of Pharmacy Airlangga University, Surabaya and BPOM reported that the benefits of guava leaves for dengue fever patients is to inhibit Dengue virus is a virus that causes dengue fever or dengue. The results of this testing will be reported to the World Health Organization or WHO for further clinical trials and if the result is positive, then there is the possibility of guava leaf extract this would be an additional or complementary in the treatment of dengue fever.